This post was originally written for and published at BC-LA blog. Yi is a project scientist at UCLA, biotech blogger at bioequity.org and associate at BCLA. Here we continue a series of posts about the public biotech and pharmaceutical companies in southern California. In this post, we will focus on Orange County (OC). OC has 14 companies. They are dominated by medical device companies, reflecting strong root of the medical device industry in OC. Edwards Lifesciences is the largest and the only big cap (>$10B) company in the list. With its $30B size and 60-year long history, Edwards clearly represents the deep and rich roots of medical device industry in Orange county. As detailed in its Our History page, the company was founded by a retired engineer Miles “Lowell” Edwards, who set out to fulfill his childhood dream of building the first mechanical artificial heart. After consulting a young heart surgeon Dr. Albert Starr , Edwards instead focused on building a less-complex artificial heart valve, for which there is immediate need. In two years, they built the first Starr-Edwards mitral valve. From there, the company started its long history of innovation and leadership in heart valve and cardiovascular care. For four decades, artificial heart valve had to be surgically installed, which limited its use and could lead to post-surgical complications. In 2002, Dr. Alain Cribier performed first-in-human transcatheter aortic valve replacement (TAVR). This innovative procedure transformed aortic valve replacement therapy and substantially reduced mortality and disabling stroke rates compared to surgery in intermediate-risk patients. Edwards Lifesciences acquired Cribier’s startup Percutaneous Valve Technologies, Inc. for $125 Million in early 2004. It now derives most of its revenue from TAVR products. With an ageing world population, the demand for heart valve replacement is growing fast. Edwards is committed to “help patients live longer, healthier and more productive lives” with better heart valves. A timeline of the company’s milestones (bottom of page). Current TAVR Devices (2017). You can find Edwards’ competitors. Animal-Tissue Valves at Heart of Edwards’ Success A LA Times article explains Edwards’ hi-tech business for the layman. If Edwards’ keyword is heart valve, ICU Medical’s is infusion. As one of the leading pure-play infusion companies, ICU Medical’s products are designed to prevent bloodstream infections and protect healthcare workers from exposure to infectious diseases or hazardous drugs. The company was founded in 1984 by George “Doc” Lopez, MD (a noted freediver and spearfisherman), who developed a product known as the ClickLock to better secure IV lines after he lost a patient due to an accidental disconnect. The ClickLock consisted of a protected needle and locking housing that prevented health care workers from being accidentally stuck by the I.V. needles. This started ICU Medical’s vascular therapy business. In 2006, ICU Medical invented the ChemoClave system and entered the oncology field. It prevents healthcare provider from exposure to harmful chemotherapy drugs. In 2009, ICU Medical entered the critical care field by acquiring former Abbott Laboratories Critical Care business from Hospira. Now, ICU Medical’s medical devices and technologies are used in vascular therapy, oncology, and critical care applications. Masimo is another medical device company that produces equipment for clinical monitoring. Masimo was founded in 1989 by electrical engineer Joe Kiani. Masimo invented measure-through motion and low perfusion pulse oximetry, known as Masimo SET (Signal Extraction Technology). SET technology is able to identify and separate venous blood signal from arterial signal in order to report accurate arterial oxygen saturation (SpO2). Compared to non-SET pulse oximeters, SET increases the ability to detect life-threatening events and reduces false alarms during challenging conditions. You can read more about the technology here. It includes an impressive false alarm rate diagram comparing Masimo SET to its competitors. 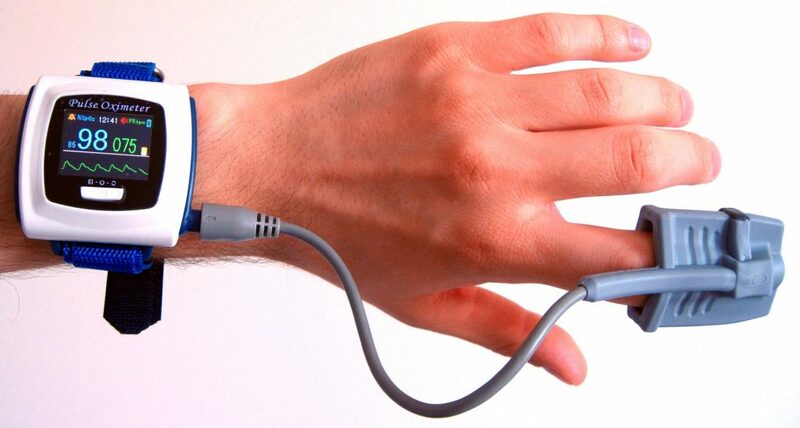 Thanks to the technology, the company sells more pulse oximetry to hospitals than any other company. Glaukos is named after the Ancient Greek word glaukos, which means blue, green or gray. It is the linguistic root of Glaucoma. Glaucoma affects 6-67 million people worldwide and can lead to permanent blindness. One of the main risk factors for Glaucoma is increased eye pressure. Conventional treatment focuses on reducing eye pressure by medication or surgery. Glaukos uses tiny “drainages” to reduce eye pressure. Founded in 2001 by Olav Bergheim, Richard Hill and Mory Gharib, the company has raised $156 million in venture funding. In 2012, its first generation iStent Trabecular Micro-Bypass was approved. Glaukos went public recently in 2015. Its secondary generation device iStent inject® is only one-third the size of the original device and features two heparin-coated titanium stents that are preloaded into an auto-injection system. It can be conveniently deployed via only one corneal entry point with a click-and-release motion. Glaukos’ iStent inject creates two bypasses, or openings, between the front part of eye and its natural drainage pathway to increase the flow of fluid. By creating the permanent bypasses through the primary blockage site (trabecular meshwork), it is designed to safely lower intraocular pressure and to improve the natural flow of fluid in your eyes. It is well ahead of competitors. For example, competitor MicroOptX is still evaluating a similar device in early human and veterinary trials. Before we talk about Evolus, we have to introduce Allergan and its Botox first. Once, Allergan was the largest independent biotech company headquartered in Orange county, before Actavis acquired Allergan in a tax-inversion transaction. Allergan’s success comes from its flagship product Botox (onabotulinumtoxinA), the blockbuster wrinkle treatment. Since approval in 2002, Botox enjoyed rapid growth around the globe, has brought in $3.2B sales worldwide in 2017. Its success has attracted many me-too competitors. There are already two more botulinum toxin based products – Xeomin and Dysport – on the market. Evolus is developing Jeuveau (prabotulinumtoxinA) – another Botox competitor. The drug candidate (codename DWP-450) is developed by Daewoong Pharmaceutical Co. Ltd. in Seoul, South Korea . While Daewoong is pursuing approval by itself or with other regional partners in East Asia or Canada, it licensed the drug to Evolus to develop it in the US. It is common for foreign companies to do this, since they lack the expertise to navigate the US regulatory process. Evolus received Complete Response Letter from FDA in May 2018. The deficiency was only related to Chemistry, Manufacturing, and Controls (“CMC”) processes. The company quickly resolved the issue and resubmitted to FDA in August 2018. A decision is due from FDA by February 2nd, 2019. Evolus went public in February 2018. You can read more about the transactional corporate history of Evolus here. If approved, Evolus’ Jeuveau will be the 4th botulinum toxin product on the market. The field is getting even more crowded soon. In February 2018, another competitor Revance Therapeutics teamed up with Mylan to develop a biosimilar to Botox. Avid Bioservices currently is a pure-play contract development and manufacturing organization (CDMO, same as its ticker symbol). Originally founded in 1981, Avid is one of the first generation biotech companies. It has changed its focus as well as names over the years. In 2000 annual report, it was called Techniclone and focused on developing Tumor Necrosis Therapy agent, which utilizes monoclonal antibodies that recognize markers found in the necrotic core of solid tumors. It acquired Peregrine Pharmaceuticals in 1997, which was developing a Vascular Targeting Agent – Tarvacin (bavituximab, an anti-phosphatidylserine) antibody invented at University of Texas Southwestern Medical Center at Dallas, for the treatment of cancer and HCV. In 2005 annual report, the company already adopted Peregrine Pharmaceuticals as its name. By 2010, Bavituximab had become its focus, with Phase II trials in non-small cell lung cancer and breast cancer. Unfortunately, Bavituximab development was discontinued after reviewing interim results in 2016. On the other hand, the company has operated a wholly-owned biomanufacturing subsidiary, Avid Bioservices, since 2005. In the wake of 2016 Bavituximab setbacks, the company saw growth and potential in Avid’s CDMO business and decided to shift its corporate focus to Avid. In early 2018, it sold Bavituximab rights to Oncologie, changed its name to Avid Bioservices and became a pure-play CDMO. ChromaDex is a dietary supplement company. Its flagship product is NIAGEN (nicotinamide riboside (NR)). It was licensed from Cornell University in 2011. Initially, ChromaDex tried to develop a nicotinamide riboside-based treatment for children afflicted with Cockayne Syndrome. It has since abandoned the clinical development efforts and decided to focus on dietary supplement business. In 2015, NIAGEN received FDA New Dietary Ingredient (NDI) status. In 2018, ChromaDex signed a deal with Nestle Health Sciences to include NIAGEN in Nestle products. ChromaDex has engaged in an interesting ongoing lawsuit against another anti-ageing company Elysium Health. Elysium initially received supply of NR from ChromaDex, but stopped paying shortly after. Elysium is now developing NR on its own as a drug candidate and a dietary supplement. FDA granted Elysium’s NR based EH301 orphan drug designation for potential treatment of amyotrophic lateral sclerosis (ALS). You can read more about their dispute in these references: 1 WIRED 2016 2 techcrunch 2017, 3 Elysium response. Revenue is still very limited. But ChromaDex is able to attract famous investors such as billionaire entrepreneur Dr. Philip Frost and Hong Kong’s richest man Li Ka-Shing. In part II, we will continue with the small 7 companies in Orange County. Content in this article is licensed under a Creative Commons Attribution 4.0 International license. I thank BCLA team members for their inputs.